Hot-dip galvanization is a method for coating steel workpieces with a protective zinc film to enhance the corrosion resistance and to improve the mechanical material properties. Hot-dip galvanized steel is the material of choice underlying many modern buildings and constructions, such as train stations, bridges and metal domes. Based on the successful German version, this edition has been adapted to include international standards, regulations and best practices. The book systematically covers all steps in hot-dip galvanization: surface pre-treatment, process and systems technology, environmental issues, and quality management. As a result, the reader finds the fundamentals as well as the most important aspects of process technology and technical equipment, alongside contributions on workpiece requirements for optimal galvanization results and methods for applying additional protective coatings to the galvanized pieces. With over 200 illustrated examples, step-by-step instructions, presentations and reference tables, this is essential reading for apprentices and professionals alike. Peter Maaß is a specialist engineer for corrosion protection. In addition to his engineering degree, he holds a PhD in economics. In his professional career he headed the central office for hot-dip galvanization of the German Democratic Republic for twenty years. 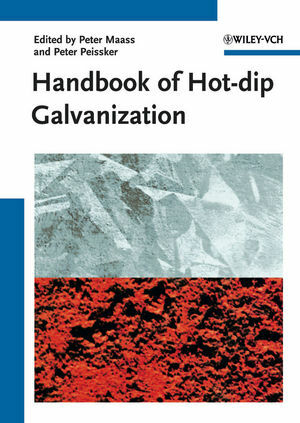 Later Peter Maaß became head of the northeastern branch of the Institute of Hot-Dip Galvanization, Ltd., in Düsseldorf, Germany. He edited three German editions of the handbook of hot-dip galvanization that became the de facto standard for vocational training.